Coming from just off the pace under Joel Rosario, Del Secco DCS Racing's Sparky Ville posted a 7-1 upset in Sunday's Grade 2 San Vicente Stakes at Santa Anita, edging 2-1 second choice Dessman by a nose. Coliseum, the 3-5 favorite who like Dessman is trained by Bob Baffert, finished 6 1/2 lengths back in third, with Synthesis fourth and Savagery the trailer in the field of five 3-year-olds. Time for seven furlongs on a sloppy racetrack was 1:21.93. The winner, a gelded son of Candy Ride bred by Aaron and Marie Jones, is trained by Jeff Bonde and was winning for the third time in eight career starts. He won the restricted Sunny Slope Stakes three starts back on Oct. 21 and was a well beaten second behind highly regarded Instagrand in the Grade II Best Pal Stakes five starts back on Aug. 11. Savagery set the early fractions in the San Vicente, going the opening quarter in :22.07 and the half in :44.32. Coliseum, who has shown a penchant for breaking slowly, was off a step behind the field and then moved up quickly to reach contention down the backstretch and engage the leader. Reaching the far turn, Flavien Prat sent Dessman toward the leader on the outside and by the time the field turned into the stretch held a clear advantage over his stablemate. Rosario, who saved ground on Sparky Ville down the backstretch and around then turn while just behind the leading group, swung the gelding outside at the top of the stretch and wore down Dessman to win by the narrowest of margins. 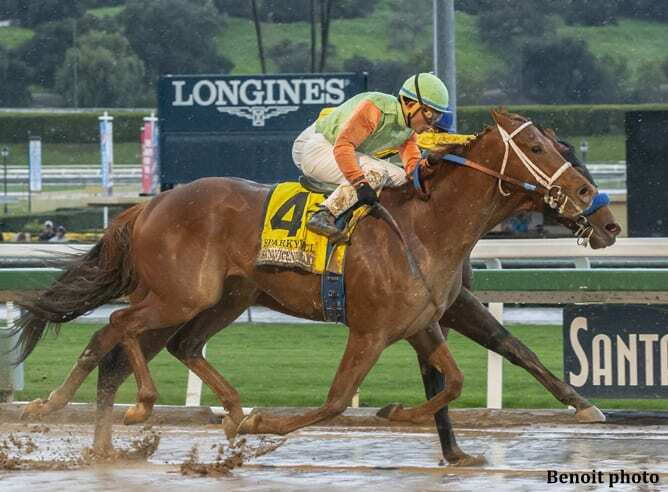 “I was absolutely dancing into the Winner's Circle,” said trainer Bonde. “It was so exciting and Joel has been like one of my kids ever since he came from Bay Meadows…So it's wonderful to win with him. The owners are great people that really deserve something like this. This entry was posted in NL List, Triple Crown and tagged candy ride, coliseum, dessman, jeff bonde, san vicente stakes, santa anita, sparky ville by Paulick Report Staff. Bookmark the permalink.